The above poster is from last year’s fabulous event! The 2017 Reel Awards™ will be held Monday, February 20, 2017 at the Golden Nugget in Las Vegas. A welcome reception and registration begins on Sunday, February 19, with the Tribute Artists Convention scheduled for Tuesday through Thursday, February 21 – 23 that includes seminars and talent showcases. Golden Nugget, 129 E. Fremont St., Las Vegas, NV. Showcases and The Reel Awards Show is Open to the Public! 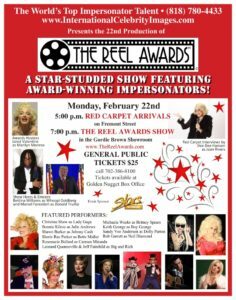 The Reel Awards™ (23rd Production) is an entertaining 2 1/2 hour show that features guest emcees and live performances similar to other Hollywood-style awards shows and recognizes the talents and achievements of outstanding individuals or groups who perform in the field of impersonation. If you didn’t get an invitation to the Oscars, or if you missed the Grammy’s then this is your chance to experience the fun of a live awards show! Our 2016 Show hosts were Bettina Williams as Whoopi Goldberg and Marcel Forestieri as Donald Trump, with one of the show’s performers, Sherie Rae Parker as Bette Midler. February 19, 2017 (Sun.) – Welcome Reception, Networking, Registration, and Refreshments followed by Live Tribute Artist performances on 1st Street Stage, located on Fremont Street. February 20, 2017 (Mon.) – Celebrity impersonators, look-alikes, sound-alikes, and tribute artists from around the world will gather for a fun-filled event full of schmoozing, red carpet arrivals, photo ops, live performances, and awards. Catch lots of Hollywood-style action with incredible talent, agents, press, news media, tourists, and paparazzi. The Reel Awards is an enchanted evening full of music, dance, comedy, and awards; a show like no other! February 21 & 22, 2017 (Tues. & Wed.) – The Tribute Artists Convention follows the star-studded Reel Awards Show as part of the week’s activities and includes talent showcases, seminars, networking and career-building opportunities, uniting entertainers with agents. Many artists have landed major career-changing gigs, due to their exposure at The Reel Awards and the Convention. Agents and talent buyers attend the live showcases to hand-pick acts for future bookings! A farewell breakfast is scheduled for Thursday morning, February 23rd. Come join the fun and be amazed by the incredible talent of these world-class performers. We’ll look forward to seeing YOU at The Reel Awards and Tribute Artists Convention – 2017! For more info call (818) 780-4433. To book impersonator talent, tribute artist shows, celebrity look-alikes, bands, musicians, entertainers and more please contact us.